I can't remember when I last visited Beaver Creek Natural Resource Area in Johnston. It hasn't been that long ago has it? 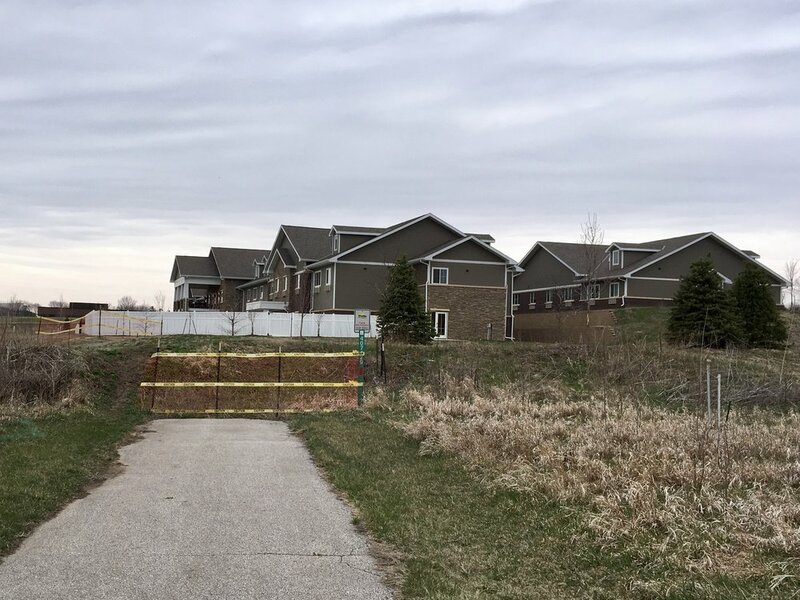 The surprising discovery of a huge building on the north end area and some sort of residential complex in a former prairie area proved it's been longer than I thought. How unfortunate that corporate/urban development had to impact such a beautiful oasis within the city. It's hard not to get bummed seeing how this natural resource has shrunk. Despite the changes, it's still worth a visit. Its looping trail begs for a leisurely bike ride, walk or jog. Beaver Creek Natural Resource Area would be a fun place to take kids for a ride. The flat trail loops and winds around without interacting with traffic. The nature area can be accessed via Crown Point, Terra Park, and Lew Clarkson Park. During the evenings or weekends, the parking lots of Pioneer Campus provide easy access. There are no facilities in this area so plan accordingly for any necessary bathroom or water breaks. The city has several informational signs posted along the trail speaking to the prairie and wetland areas. Beaver Creek Natural Resource Area consists of 156 acres of wetland, prairie and woods along Beaver Creek. It’s a beautiful trail with several educational signs along the route and lots of nature. Once upon a time, the Johnston area was a stop along a railway that traveled between Des Moines and Perry. The Johnston Inter Urban trail is on this former train track. Trail surfaces vary from asphalt to concrete. On portions of the Beaver Creek route the trail was bumpy due to tree roots growing underneath the asphalt. The trail runs flat with a significant grade after crossing NW Johnston Drive. At NW 62nd Ave the trail turns to sidewalk for about 2 blocks. Other than the wooded areas around Beaver Creek, this trail is out in the open with several portions flanked by trees or neighborhoods. I had planned on parking at Lew Clarkson park. However it appears this park is closed when softball or baseball games are not going on. Instead, I began my ride in the lot of Timber Ridge Elementary. Entering the ball fields in Lew Clarkson park I saw a large cement pillar with the Little League pledge posted on it (along with a wad of chewed gum). After weaving my way through the ball fields I entered the Beaver Creek Nature Area and immediately saw a deer. It was a young buck unconcerned about my presence. Next, I crossed the Beaver Creek bridge and then spotted a sign informing me there could be deer hunters in the area! What?? I never considered the need to wear hunter orange on a bike ride, especially in the middle of town. On the northern portion of the ride I saw a Little Free Library outside of Henry Wallace Elementary. I’ve heard about these but hadn't seen one in real life before. Super cool!! It was filled with books ready for someone to borrow. By the Pioneer campus I couldn’t help but notice the biggest pitchfork I had ever seen. A man was out inspecting it. Maybe he was sharpening the tines to get it ready for pitching the worlds biggest hay bale! There are no trail facilities along this route so plan accordingly for any necessary bathroom or water breaks. The Beaver Creek Natural Resource area would be a perfect place to take kids for a ride. The flat trail loops and winds around without interacting with traffic. Bike rides in areas also used for hunting are a great reason for wearing bright colors!! This was a great route for a day where I didn’t have a lot of time for a bike ride.